How has your month been going? Mine has been pretty hectic which is one of the reasons I haven't been blogging of recent. I've been looking forward to updating you guys on the gems I've discovered for natural hair and skin care! Today, I'd love to share with you a little gem that has made my skin very very happy. First off...this is NOT a sponsored post. I bought all products mentioned with my money...but even if it were, trust that I'll always give you the real deal! I have combination and sensitive acne prone skin. It's very oily on my T zone and cheeks and normal the rest of the way. It easily gets red and irritated when I use certain products and wastes no time in giving me painful bumps, cysts and rashes. I've always wished I had normal skin without all the drama (because I'm a pretty laid back person and dislike drama) but alas, I missed that train! I've had cystic acne on my face and back but with careful maintenance have been able to nurse my skin back to health. With this background, I am extremely careful with what goes into and onto my body. Back to this gem I found! I've had good success using natural skin care products lately. Mind you, just because it is natural doesn't mean it is the right fit for your skin! 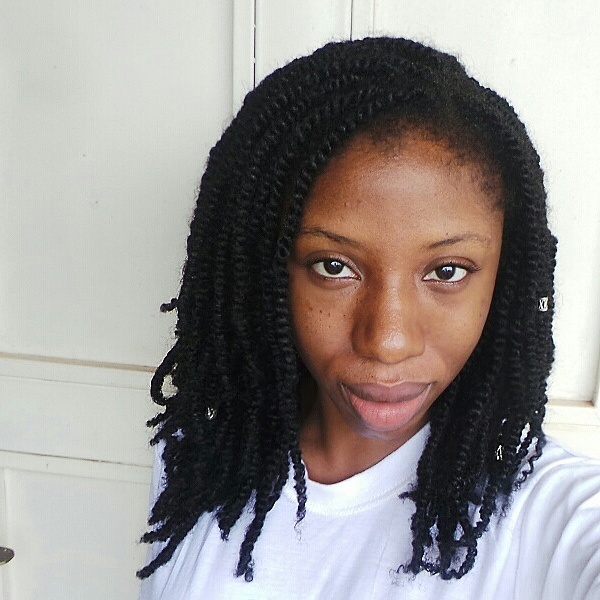 I've had serious breakouts using pure, natural, unrefined coconut oil! With oily acne prone skin, it's understandable if you don't want your left ear to hear anything called 'oil'!!! Thank God for Google though....one learns a lot of new things. I saw this article about different oils for different skin types and after doing thorough research (Hello, Google Scholar), I wrote a post that summarises what oils work with acne prone skin. 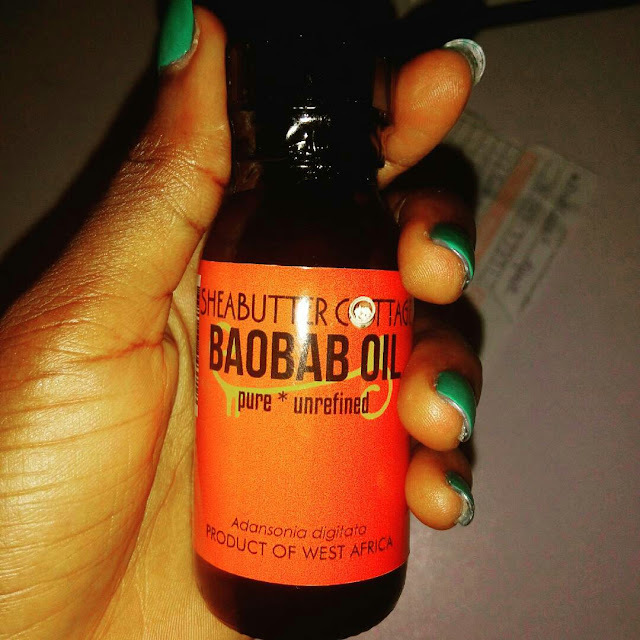 One of the oils I've tried and come to love is Baobab oil! It is a constant in my facial oil mix. It was introduced to me by Rachel of BeautifullyNappy and I'm completely hooked! Thanks lover!!!!! I love how comfortable and relaxed it gets my skin especially when for some reason it gets overly sensitive. On the plus side, it also worked to fade out circles and even out my skin tone. It doesn't work instantly o! With consistent use though I noticed a difference especially after taking this picture! I was pleasantly surprised with the change in my skin! The scientist in me understands though that there are many factors that may have come into play to get my skin clear but I would like to include this oil because in addition to my reetha scrub, african black soap mix and clay masks, this oil with a few other oils have been used consistently in my facial oil mix for more than 8 months and I've struck gold! 👉A. digitata L., commonly known as “baobab” (Malvaceae) (or bottle tree, upside-down tree, and monkey bread tree), is regarded as the largest succulent plant in the world with a diameter of 10–12 m and a height of up to 25 m. The large egg-shaped fruit capsule, covered by velvety hairs, contains numerous seeds and can reach 12 cm or more. 👉The fruit pulp (white in colour), clustered around the seeds and fibres can be removed from the shell and it is very rich in vitamin C.
It is estimated that it takes 8 to 23 years before the baobab can produce seeds and the mature plant can produce more than 30 kg of fruits ( Ibiyemi et al., 1988, Gebauer et al., 2002 and Drake, 2006). 👉The semi-fluid slightly scented golden-yellow oil is generally obtained by pressing the seeds followed by filtration. Baobab oil is extremely stable with a highly variable shelf life estimated to be between 2 to 5 years. 👉The seed oil composition is mostly β-Sitosterol (≈ 80% of the total sterols) is one of the major sterol constituents present in baobab seed oil. (Baobab Fruit Company).β-Sitosterol is a known anti-oxidant able to reduce DNA damage and the level of free radicals, in addition to possibly increasing the level of typical anti-oxidant enzymes. 👉In recent years, baobab oil has been added to the list of fixed oils commonly included in cosmetic products. Baobab oil will not burn the skin when applied as such, and it is said to be non-irritating as well as non-sensitising (Wren and Stucki, 2003). Like avocado oil, baobab oil is highly penetrating, deeply nourishing and softens dry skin. It is known to restore and re-moisturise the epidermis. 👉Several vitamins, including vitamins A, D, E and ‘F', are present in baobab oil (Nkafamiya et al., 2007). Vitamins A and ‘F' are polyunsaturated fatty acids and these acids are directly implicated in the rejuvenation and renewal of cell membranes, while vitamin E is a superior anti-oxidant, with an anti-ageing effect. 👉Baobab oil is ideal to help treat dry and damaged skin, is used for intensive hair care and its soothing properties are helpful for eczema and psoriasis treatments. Baobab oil is considered to be a natural source of vitamin D3 which increases calcium absorption and decreases blood pressure in the elderly (Wasserman, 2004). The oil is said to alleviate pain from burns and regenerates the epithelial tissues in a short time, thereby improving skin tone and elasticity. *Red highlights stuff I think would interest you!!! Drake, E., (2006). A Book of Baobabs, Aardvark Press, Cape Town. Vermaak, I., Kamatou, G.,Komane-Mofokeng B, Viljoen,A. and Beckett, K. (2011). African Seed Oils of Commercial Importance-Cosmetic Applications, Southern African Journal of Botany, 77(4):920-933. It's no wonder that this oil is my new found bae!!!! It's currently sold out at BeautifullyNappy Store (see, I'm not the only one) but I was reassured they'll be restocking soon!Try sign up to their newsletter so you'll be informed immediately it's available and you can snap it up quick!